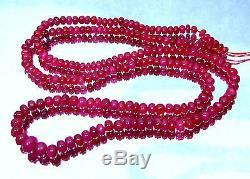 RARE TOP GRAGE GORGEOUS NATURAL RED RUBY RONDELLE BEADS 3.5-5mm 16 FULL STRAND!!! 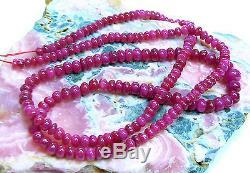 GENUINE SMOOTH 100% NATURAL UNTREATED RED AFRICAN RUBIES!! BEAUTIFUL NATURAL UNTREATED BRIGHT RED COLOR!!!! SIZE: 3-5mm diameter by 1.5-3.5mm thick!! Perfect for your Custom jewelry! Can be used for a lot of your custom design projects or collection purpose!! 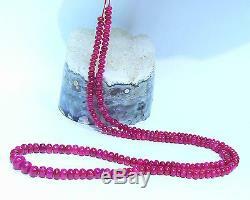 The ruby is considered to be the most powerful gem in the universe, and is associated with many astral signs. Given as a gift, the ruby is a symbol of friendship and love. The ruby is also the symbol of vitality and royalty. To own a ruby is said to have contentment and peace. Placed under a pillow the ruby may ward off bad dreams. Since ruby is a gem for the Planet Sun, this gem is believed to give a person success in all the fields of life and will improve relations with business staff and family members. Also this gem has the power of attracting each other and keeps good relationships. I HAVE GREAT SELECTION OF FINE JEWELRY, UNIQUE GEMSTONES, FRESHWATER AND TAHITIAN SOUTH SEA PEARLS!! 5 0 for each additional item ships in the same package (must be paid together). WE WANT HAPPY CUSTOMERS ONLY! Show off your items with Auctiva's Listing Templates. 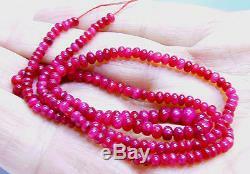 The item "AAA RARE TOP GRADE GORGEOUS NATURAL RED RUBY RONDELLE BEADS 3-5mm 47cts 16" is in sale since Wednesday, August 17, 2016.